Hello dolls! Hope everyone has had a fabulous week so far! The weekend is officially in sight and I don't know about you but I am definitely ready! By now you've probably heard about or at least seen these Tiffany Blue bears somewhere on social media and if not, it's possible you've been living under a rock. After seeing them pretty much everywhere and seeing almost every female celebrity (I'm looking at you Kardashians, Jenners, Vanessa Hudgens, Emily Ratajkowski and more) talking about these I decided to give them a try. If you know me, you know that my hair is definitely one of my biggest insecurities. As I've gotten older my hair has gotten much thinner and it's always been fine so it's difficult to curl and keep curled, it splits easily among other things so anything that promises to help those issues I'm willing to give a try. 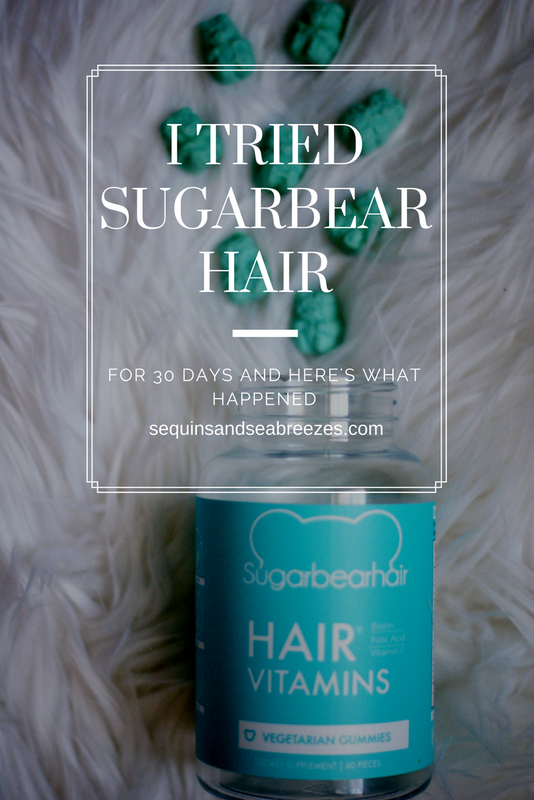 If you haven't heard of SugarBearHair, I'll give you a quick run down before we go into my rundown. SugarBearHair claims to feature 15 natural vitamins (such as A, C, D and E) and minerals including zinc, Biotin and B-12, as well as coconut oil, additives and sugar all of which are supposed to promote hair growth, increased hair shine and reduce hair breakage in a sweet tasting gummy to encourage you to want to take your vitamins. Two things I will note that are missing from SugarBearHair are protein and iron which are both key ingredients in hair growth. 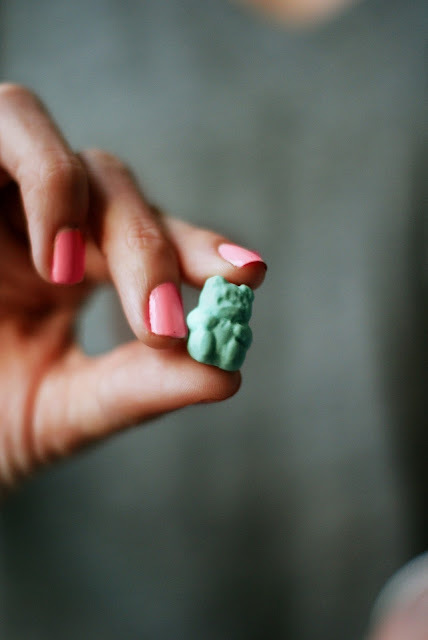 The gummy is a pretty Tiffany Blue color (hello my favorite color!) and is in the somewhat shape of a bear. Some of the gummies came out looking like a severely deformed bear but I won't judge them on that. Ok, now that you know the basics let's talk about what happened when I tried SugarBearHair for 30 days. First I'll note that I'm not a huge fan of gummies. I take gummy vitamins because it's pretty much the easiest way to convince me to take vitamins but given my choice of candy, gummies would be pretty far down on the list. These however were definitely the exception to my rule. I popped my first one and was immediately addicted. They aren't too chewy or soft and they taste like dessert, no joke, they are seriously delicious. After taking my daily allotment of two, I was craving more but I didn't want to mess up my trial so I withheld my craving until the next day. I didn't exactly measure my hair before taking these but I did know about where it was down my back so I had some basis to go off of, even if it wasn't 100% accurate. Right away I noticed that my hair held a curl better (still not perfect) and it lasted longer, but this could also be attributed to the lower humidity we've been having here in Florida lately so I won't say that was definitely from the gummies. After two gummies a day for 30 days I'd say my hair has grown maybe 1/2 an inch, still breaks easily but it is shiner and softer feeling. So all in all, not overly great results and certainly not anything dramatic. In all fairness, maybe you have to use these for more than 30 days to see any major changes but I wouldn't say these are a miracle worker of hair. Would I buy them again? Probably. But it'd probably be more for the taste than anything. I wonder if one of their secret ingredients is crack? I kid. Kind of. I took these for a few months and didn't see much results. I had the same as you did with my hair being a little shinier and softer. Honestly, I had better results with some cheap target ones. My hair has gotten thinner as I have gotten older too, especially from medications I've been on throughout the years. Thanks for sharing your results! I have always wondered about these! 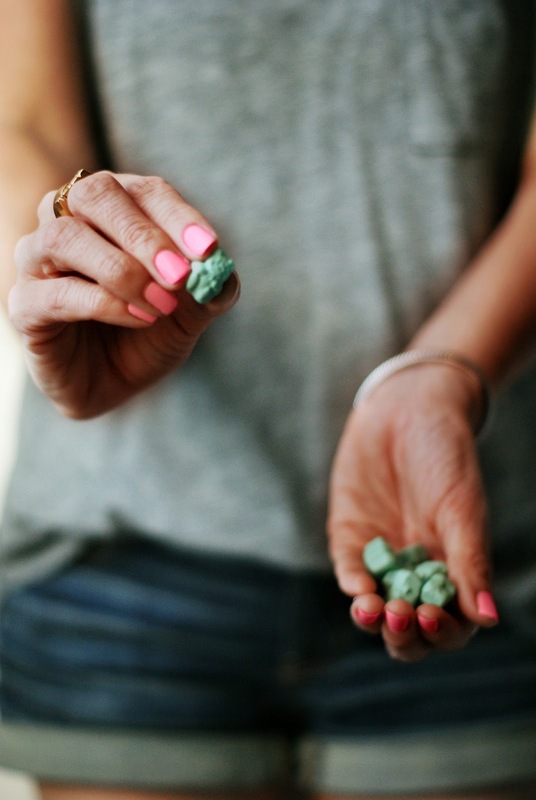 I love my gummy vitamins because they make me feel like I am eating candy, rather than taking a vitamin. Sounds like these do have some benefits, but not necessarily the miracle everyone makes them out to be! My hair is thin, too, and I've had some falling out lately due to stress. I wish there was a magic fix! I laughed at the crack comment! I've wondered about these and their effectiveness! I am glad you posted about these. I have been taking Biotin for years, and when I saw these, I thought what is the difference? I noticed that the Biotin amount in these little gummies was twice the amount I was taking, so I took two, and I feel like it does make a difference. I notice that my nails grow super fast, and are stronger as well. I stopped taking hair vitamins for awhile but I can tell a difference in my hair as I'm getting older! I need to check these out.. Thanks for sharing!! I've always wondered about these!! I'm always skeptical when celebs promote stuff like this because it's so common for them to wear extensions these days, but I'm glad you noticed a few improvements when you tried these & yay for them tasting good! Thanks for your honest review of this! It's so easy to get sucked into something because of celebrity endorsements. Have you ever tried just taking a biotin supplement to help with your hair? I take an extra-strength one (10,000 mg) every night, and it has helped my hair so much. So I'm one of those people that's been living under a rock because I had no idea about these! It sounds like a pretty good concept though to get people to take vitamins and try to make your hair stronger! I have always wanted to try a hair vitamin, I have just never gotten around to actually purchasing them. Thanks for your honest review of these. They are super cute though and any improvement is good in my book! I've always wondered about these, so thanks for sharing! Have you tried pre-natal vitamins for hair? I second with Ashley. Prenatal vitamins girl. They are like miracle grow for your hair and nails! I've tried other ones, but not these, so I'm glad to hear what you thought! I have never tired a hair vitamin but have always thought about it. I too have thin hair but alot of it so it looks thick than it really is. I really like your honest review of these. I am a firm believer in pre-natals and biotin to work for hair, and coconut oil scalp massages. I have done all three of these since I was in college and they work! At least they're yummy but small results in 30 days is promising since you probably do need to use them for a longer period of time to start seeing any major results. These look interesting!! Thanks for sharing! Sorry they didn't work completely, but the fact that they taste great has me so curious. haha I happen to really love gummies!